Looking extremely casual in an old t-shirt, baseball cap, faded jeans and a little unshaven, Pattinson, 26, looks happy and relaxed to have the movie that changed his life behind him. As usual, he doesn’t talk about his relationship with co-star Kristen Stewart, but talks a little of what’s to come post-Twilight, as well as addressing the rumors about him playing the lead in the film adaptation of 50 Shades of Grey. He will next star in David Cronenberg’s Cosmopolis. Robert Pattinson: Out of the whole series? RP: Probably that a bit in the first one, just when Bella is in the hospital, and she says, ‘Don’t ever leave me again,’ and I say, ‘Where am I going to go?’ or something like that. I still think that’s kind of my favorite scene in it mainly because it was so different what happened after it, and we made up the lines there and that’s how different the shoot was. Like every movie afterwards, the idea of making up lines, is kind of just unheard of and so I loved that bit. But the hardest was probably the birth scene in the first part of this one mainly because it was hilarious, and it was supposed to be really serious. (laughs) And there was one shot where we had to look directly into the camera, and I was crying with laughter, and I’d have to go down and chew the baby out and I would like, I was stopping tears from coming out of my eyes, and it looks like I’m crying in the thing. And I’m not supposed to be able to cry as a vampire and I’m like crying in the scene but I was laughing. RP: For some reason, I listened to Taylor at Comic Con talking about the clumsy thing, and I thought, ‘Was she clumsy?’ (laughs). And everyone always talked about the clumsiness. But yeah, I never understood it. It’s always the aspect of female characters and young female characters that’s supposed to be unattractive about them when they are clearly not unattractive? (laughs) It’s like, she’s really clumsy, and I’ve never met a genuinely clumsy person or noticed someone who is like handicapped by being so clumsy, (laughs) like it’s so weird. Q: Do you think you have a quality of timeless gentlemen? Q: Do you like that type of character? RP: Yeah, sometimes, sometimes it’s really nice. I was watching Water For Elephants on TV the other day, because it’s not got to the point where it’s far enough away and I don’t even recognize myself, and I just thought it was really sweet. It’s like an old-fashioned movie, and yeah, it is quite fun playing it. When you are doing it, it’s kind of annoying, because my instincts, they want to go to the absolute possible place and you know that it never, this person would never do this, and most of the characters I play are innately kind people which is quite nice, because people aren’t genuinely very kind. Q: So do you have this sort of urge now to do something, play the mean guy, play the meathead? RP: I kind of always did that up until Twilight. Like, apart from Harry Potter, I mean every part I played is always kind of like sort of weird. But I don’t know, I find kind of random things, the movie I’m doing next, is a real guy, an interrogator and he’s not particularly weird or anything, he’s just like, he’s kind of, well he’s a little weird. RP: It’s about the guy who found Saddam Hussein. It’s a military interrogator, based on this guy called Eric Maddox. It’s this crazy story, but he basically talked to about 250 people, none of whom were on any of the US Armies Wanted Lists, and found Saddam Hussein when no one even knew he was in Iraq. So it was an interesting story. Q: Have you read 50 Shades of Grey and did you know it was based on you and would you star in it? Q: She said you could never play the role that was based on you? Q: You said you just watched Water For Elephants. How do you feel when you watch your own movies? Does it always take a while for you to separate yourself? RP: Yeah, a couple of years at least. But I really like the first Twilight movie now, cause it’s on TV constantly, (laughs) so I’ve seen it like six times, but I remember watching it the first time at the premiere and I had to leave. I left and I sat in the car and it was also kind of overwhelming to me. I started to have a panic attack in the cinema, and then I ran out and got in the car, and I didn’t even realize there was someone videotaping me through the car window, they are right next to me sitting and I was like ‘Oh god!’ Now it’s kind of different. But I find it really hard to watch stuff although I watched Cosmopolis and because it’s so stylized I found that not too hard to watch. Q: What do you think about when you watch yourself in movies? RP: I don’t really know what I’m doing when I’m doing it, (laughs) I find a lot of the time it’s like tossing a coin and if something comes out good or not when you are doing it, even in the scene… I don’t understand these actors who can consistently turn up to work and just be like in ‘acting mode.’ And just be really good all the time. Like I can literally walk onto a set and have absolutely no idea, I’ve done all of my preparation or whatever and have no idea what’s going to happen until I open my mouth at all. And I can also feel that something went terribly, when it’s the best scene in the movie or whatever. I have no idea ever. Q: You are a method actor. RP: (laughs) I don’t know if I’m completely together in my own method. Q: Did you have to prepare differently for this one? There was a lot of physicality and also and also, anything you can give us about the final sequence, how was it to shoot? RP: I’m all right at doing it. It’s film fighting, you don’t really have to be that fit, cause it’s not really like normal fighting, like you have to kind of be quite flaily, and I’m quite like mal-coordinated. I’m quite gangly, and so it’s easy for me to kind of do, because if you are throwing a punch, you throw a punch and it’s so huge, where most people who like actually box a lot or something, are so used to keeping it tight, and it feels so fake to them. But I find that kind of stuff quite easy, and can do it on one or two takes. Like everyone else who were really physically fit has to do like ten. But the only annoying thing is the wire stuff, but I never see anyone who’s good at like anything on a wire, it’s always through the operator. If you get a good wire team, then you will look good. If something is not that well organized, you will just look terrible, no matter how good you are at it. RP: I mean, most of the time you were just so tired, (laughs) the whole time you were just going through the motions. Q: Do you have a memento from the set? RP: I have almost every costume from the first one because I was wearing that stuff for about two years, (laughs) afterwards. Q: You are in the baseball scene, do you have a baseball outfit? Q: What was your favorite one that you kept? RP: I had these jeans which I kept. I literally bought all these clothes and then got the company to pay me back on the first one. You could do anything on the first movie, it was crazy. I was stuck in Vancouver getting my Visa by myself. I started just borrowing my costumes (laughs) and I kept them all for years afterwards. Q: What a huge difference. Q: After all these years, what will you miss the most? RP: There is something incredibly familiar and nice about it and it’s normally what you are doing when you turn up on a movie set when you know everyone is so, like normally it’s like the first day of school every time you start, but when you know people. It’s strange, and it is pretty nice. Like when you are doing a job where everything changes all the time, say doing a TV show, but at the same time, that’s one of the greatest things about acting as well, (laughs) you can just leave everybody behind. Q: After all this success, what do you do to keep grounded? Q: What do you miss doing the most that you can’t do now? Q: What’s the best thing that you’ve got? Original Independent portion and PDF images after the cut! Twihards rejoice! If you thought that Breaking Dawn –Part 2 would be the last time you got to sink your fangs into Edward Cullen, Bella Swan and Jacob Black then think again (and no, I’m not talking about Fifty Shades of Grey). With just weeks before the Twilight Saga’s cinematic finale arrives, you can indulge in the experiences that catapulted Robert Pattinson, Kristen Stewart and Taylor Lautner into international stardom – in their own words. A tome that in paper form might be rather heavy to lug around has been published today digitally – available to Twilighters on Kindle and other e-readers. It contains 30 interviews with the cast dating from 2008 when the first film was released. Its author Talia Soghomonian met and interviewed the trio at various points during the filming of Twilight, charting their progression from normal teenagedom, and relative obscurity, to the Hollywood A-list. Everything might have since gone awry between real-life couple Pattinson and Stewart in the wake of reports that she cheated on him with her Snow White and the Hunstman director Rupert Sanders. Twihards were devastated when the relationship, that seemed to underline the fictional one, went wrong (please let the reports “they’re working on it” be true). But Soghomonian’s interviews were conducted before the proverbial hit the fan, which means the book is choc full the pair’s collective gushing. Having never confirmed that they were an item prior to the allegations of Stewart’s affair (it being the best known “secret” in Hollywood), they are characteristically tight-lipped about their personal lives. Looking extremely casual in an old T-shirt, baseball cap, faded jeans and a three-day beard, Pattinson, 26, looks happy and relaxed to have the movie that changed his life behind him. What was the hardest Twilight scene to film? ROB: Probably that bit in the first one, when Bella is in the hospital and she says: "Don’t ever leave me again," and I say, "Where am I going to go?" or something like that. I still think that’s my favourite scene in it mainly because it was so different what happened after it. We made up the line there and then, that’s how different the shoot was. Like, every movie afterwards, the idea of making up lines was just unheard of so I loved that bit. But the hardest scene to film was probably the birth scene in Breaking Dawn- Part One, mainly because it was hilarious, and it was supposed to be really serious. [Laughs] There was one shot where we had to look directly into the camera, and I was crying with laughter. I’d have to go down and chew the baby out and I was stopping tears from coming out of my eyes, and it looks like I’m crying in the thing. And I’m not supposed to be able to cry as a vampire. Have you read Fifty Shades of Grey, the E.L James book supposedly based on you? And would you star in it? She said you could never play the role that was based on you? What do you think about when you watch yourself in movies? 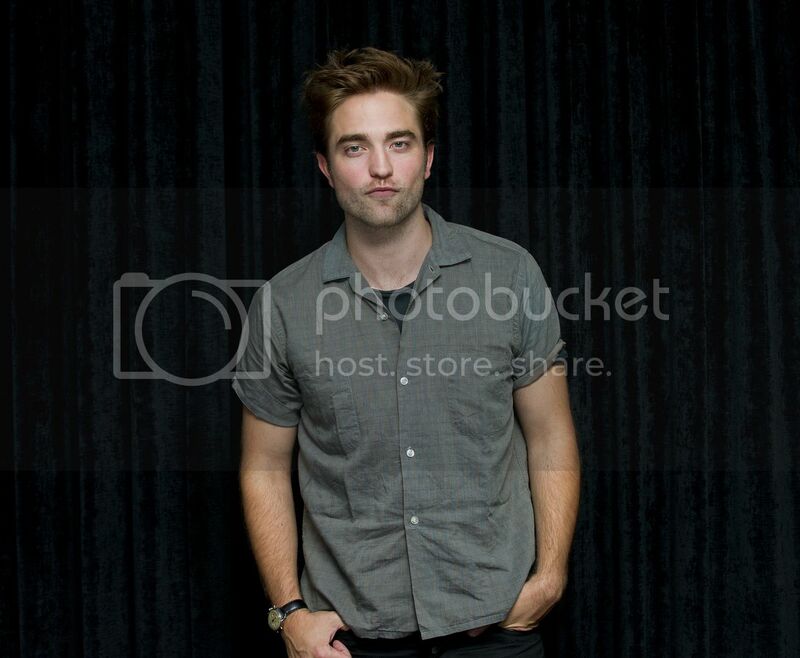 ROB: I don’t really know what I’m doing when I’m doing it [Laughs]. I find a lot of the time it’s like tossing a coin and if something comes out good or not when you are doing it, even in the scene… I don’t understand these actors who can consistently turn up to work and just be in ‘acting mode’ and just be really good all the time. I can literally walk onto a set and have absolutely no idea. I’ve done all of my preparation, or whatever, and have no idea what’s going to happen until I open my mouth at all. And I can also feel when something goes terribly, when it’s the best scene in the movie or whatever. I have no idea ever. What will you miss the most about filming Twilight? ROB: There is something incredibly familiar and nice about it. I turn up on a movie set and know everyone. It’s like the first day of school every time you start. What do you do to keep you grounded? What has fame stopped you from doing? Fanvids: Robert Pattinson - "I Follow You"